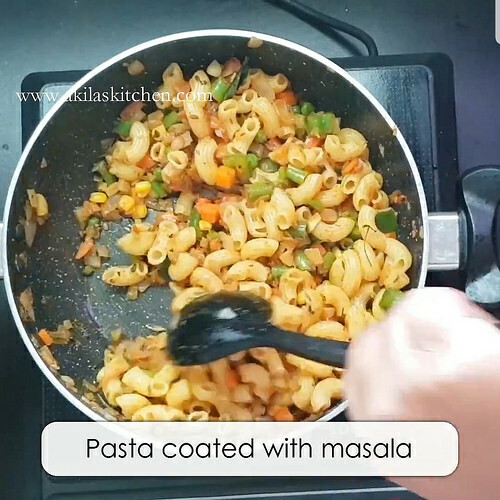 Masala pasta | Indian style Masala Pasta recipe using step by step instructions and video for your easy understanding. 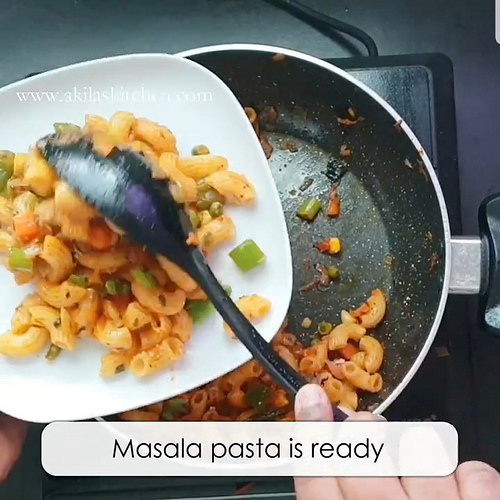 Today we will learn how to make masala pasta | Indian style Masala Pasta with an easy step by step pictorial instructions and the video. 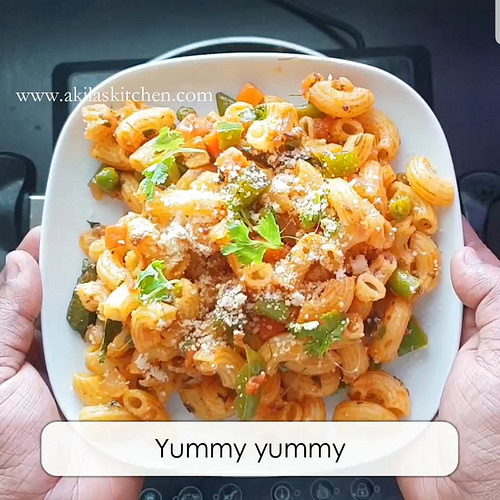 Pasta is an Italian Dish, but we Indian convert them to suit our taste with our culinary skills to make it more healthier and suitable for kids.That is how this masala pasta came. 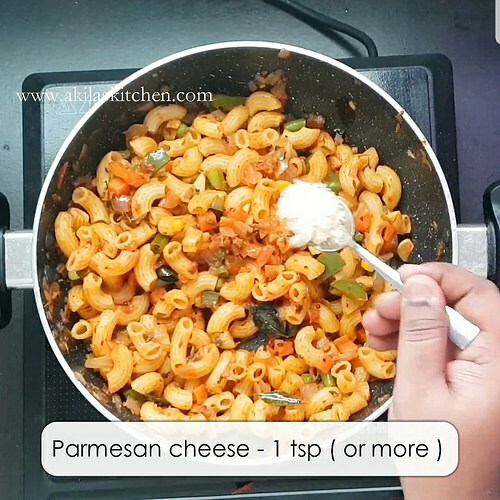 I am not a big fan of pasta or macaroni recipes and I have cooked only this pasta payasam previously. But now a days my kids started asking to make different pasta recipes and I started preparing them. 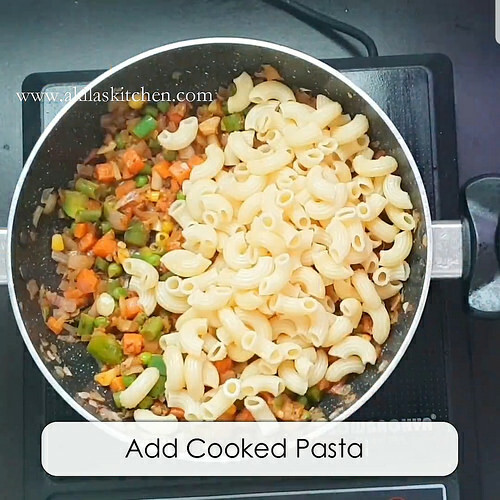 This masala pasta is added with lots and lots of veggies of your own choice to make it more healthier so that kids can eat veggies along with the pasta. 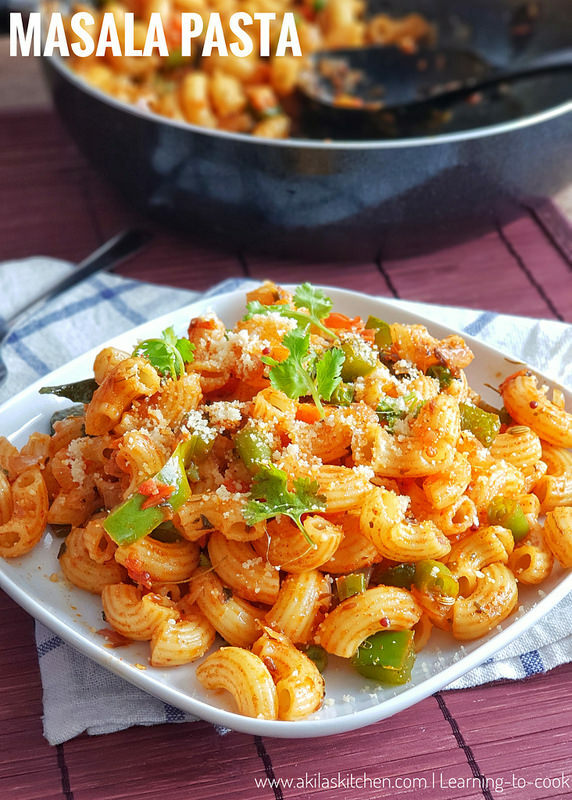 Pasta is an Italian Dish, but we Indian convert them to suit our taste with our culinary skills to make it more healthier and suitable for kids.That is how this masala pasta came. 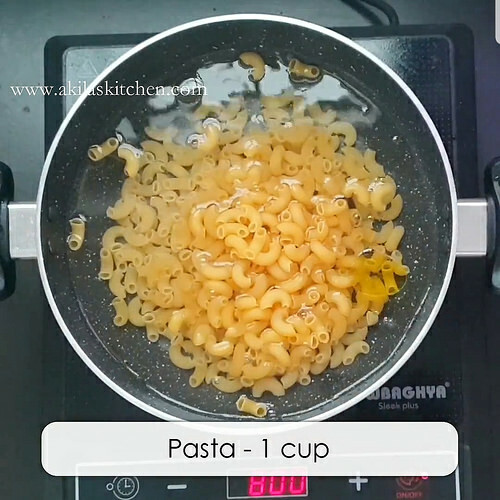 Cook pasta as per the instructions or add enough water, oil and salt and add the pasta. 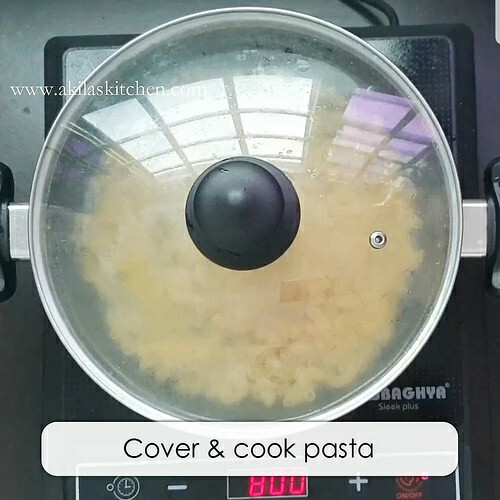 Cover and cook the pasta 8 to 10 minutes or until the pasta is cooked well. Filter and drain the water. Keep the cooked pasta aside. 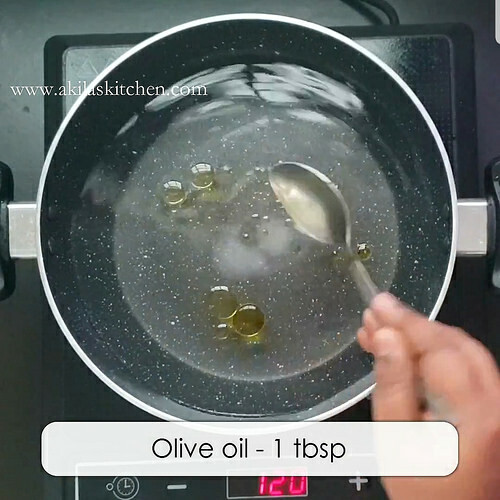 In a pan add oil and when it is hot and mustard seeds and the urud dal. 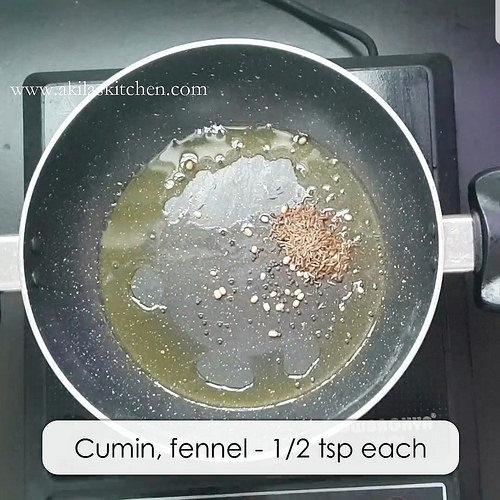 Add the cumin seeds and fennel seeds and fry them for a minute do not over fry them. 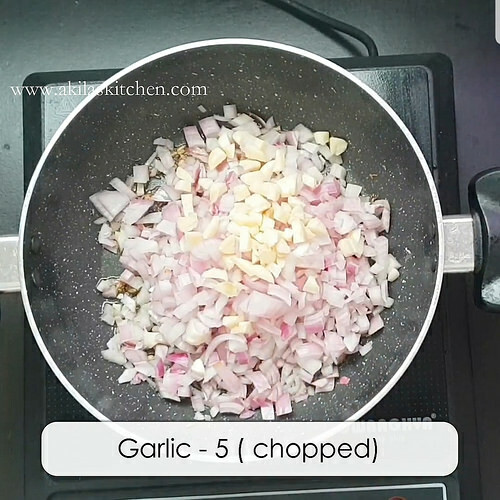 Now add Onion and garlic and saute them nicely till the onions become translucent. 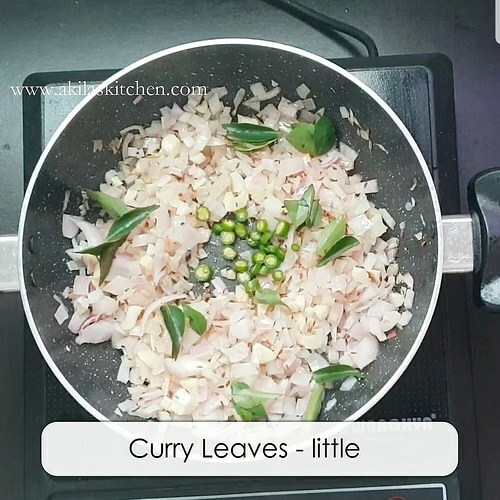 add green chilies and the curry leaves and again saute them. Add the mixed vegetables and saute then again. If you want add little oil and saute them so they get cooked nicely. Add salt, turmeric, chilli powder, turmeric, coriander powder, garam Masala and mix well. Also add cumin powder and the dried fenugreek Leaves ( kasoori methi ). Let the veggies gets cooked with the Masala. 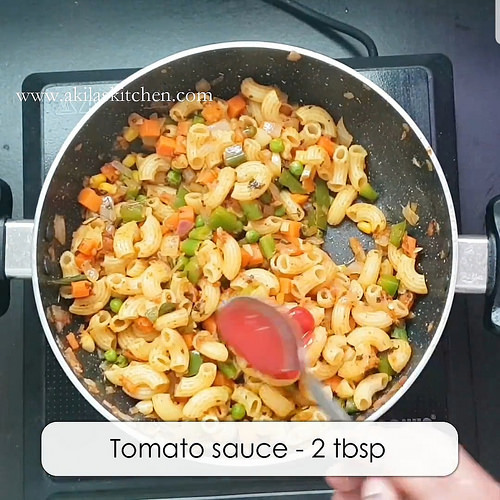 Now add the cooked pasta and mix well for 5 to 7 minutes another pasta is also coated well with the Masala. Now add the tomato sauce and mix well. 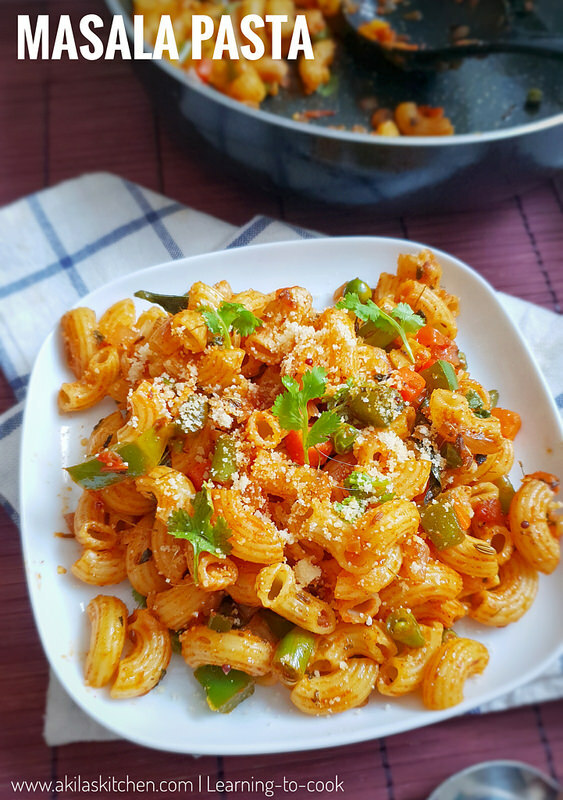 This step is optional but it gives great taste to this Masala pasta. 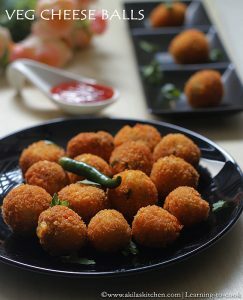 Add the parmesan cheese and garnish with coriander leaves and serve it. Yummy yummy Masala pasta is ready. 1. 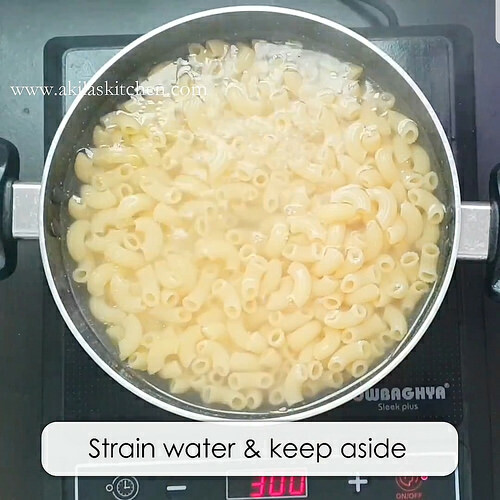 Cook pasta as per the instructions or add enough water, oil and salt and add the pasta. 2. Cover and cook the pasta 8 to 10 minutes or until the pasta is cooked well. Filter and drain the water. Keep the cooked pasta aside. 1. 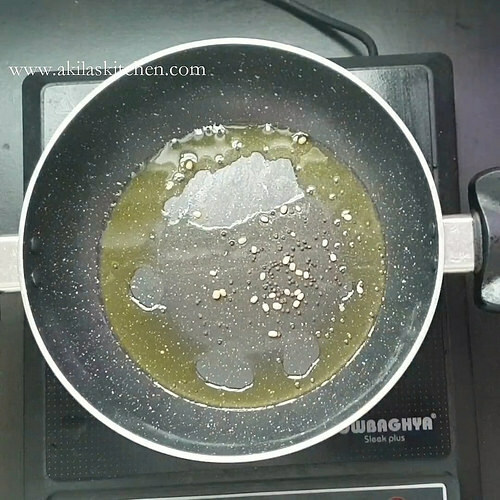 In a pan add oil and when it is hot and mustard seeds and the urud dal. 2. When mustard seeds splutters, Add the cumin seeds and fennel seeds and fry them for a minute. do not over fry them. 3. 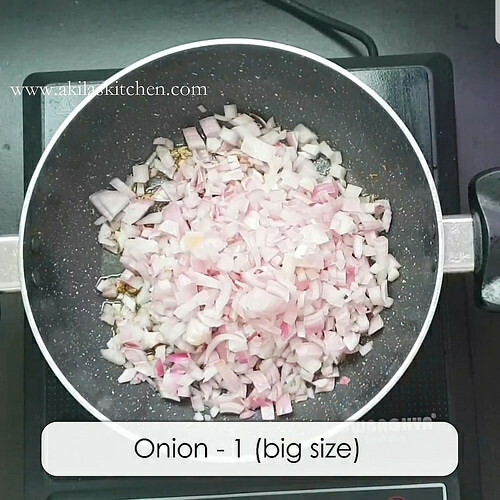 Now add Onion and garlic and saute them nicely till the onions become translucent. 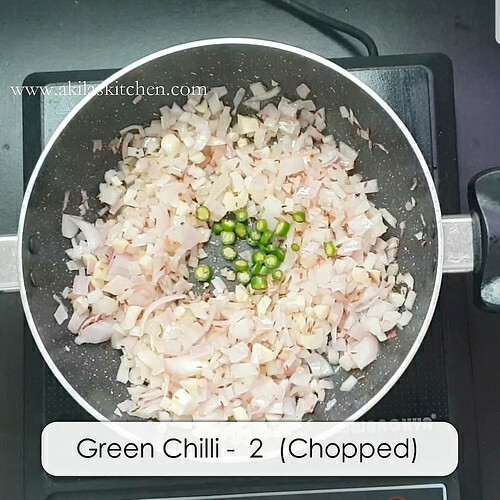 4. add green chilies and the curry leaves and again saute them. 6. 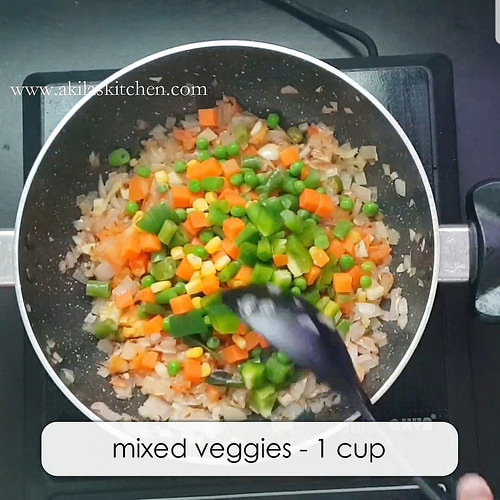 Add the mixed vegetables and saute then again. If you want add little oil and saute them so they get cooked nicely. 7. Add salt, turmeric, chilli powder, turmeric, coriander powder, garam Masala and mix well. 8. 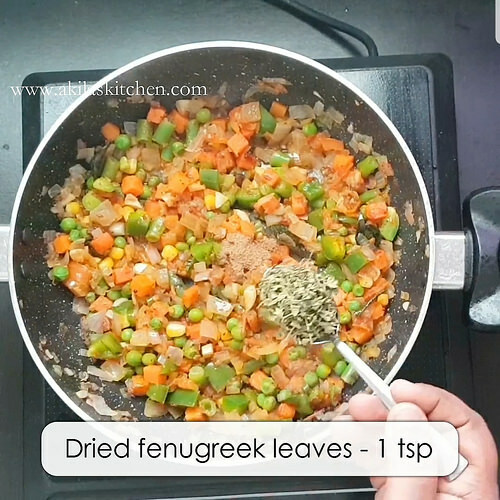 Also add cumin powder and the dried fenugreek Leaves ( kasoori methi ). 9. 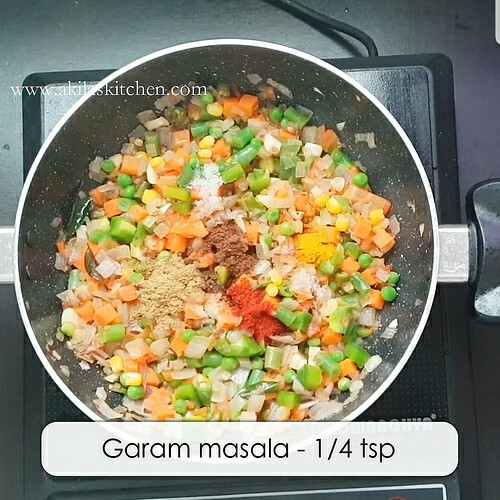 Let the veggies gets cooked with the Masala. 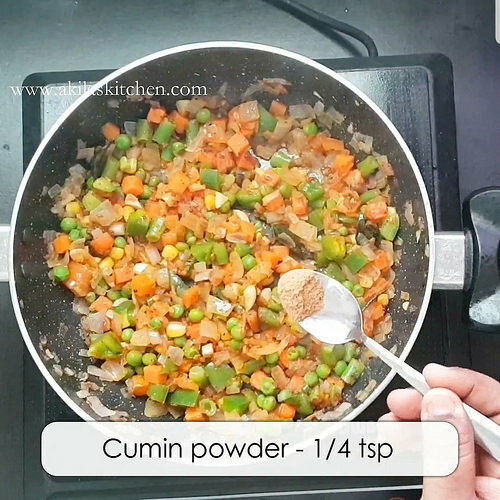 Now add the cooked pasta and mix well for 5 to 7 minutes so that pasta is also coated well with the Masala. 10. Now add the tomato sauce and mix well. 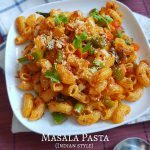 This step is optional but it gives great taste to this Masala pasta. 11. 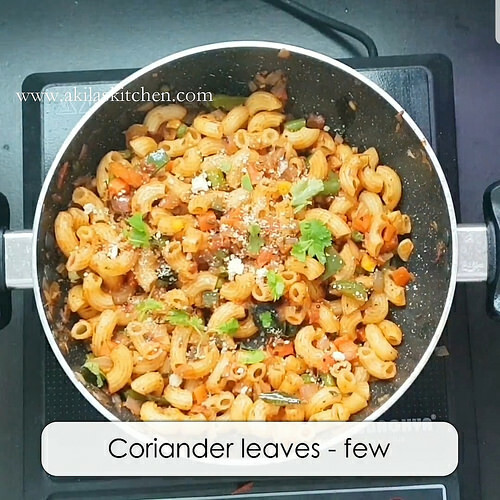 Add the parmesan cheese and garnish with coriander leaves and serve it. 12. Yummy yummy Masala pasta is ready. 1. 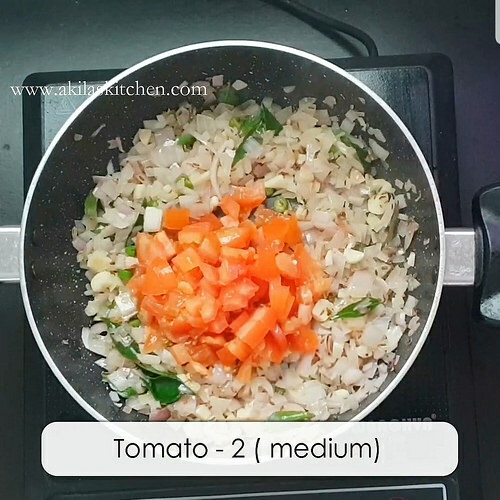 Instead of tomato, you can puree the tomatoes and add them. 2 . Adding Tomato sauce is optional but it’s gives great taste. If you want more spicy, you can add a tbsp of chilli sauce also. 3. 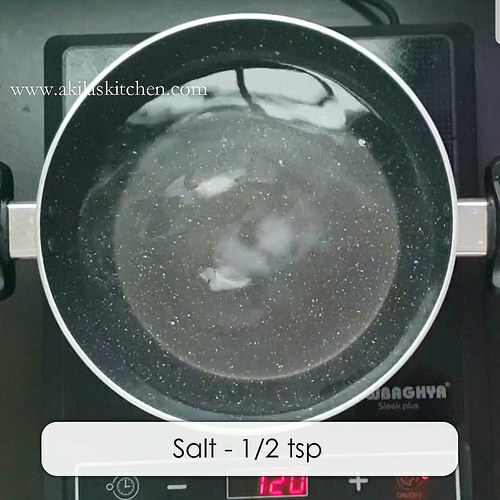 You can also add a 1 tsp of sugar if don’t add tomato sauce. Adding sugar also gives a great taste. 4. Adding parmesan cheese gives a nice taste a s kids would love them. 5. 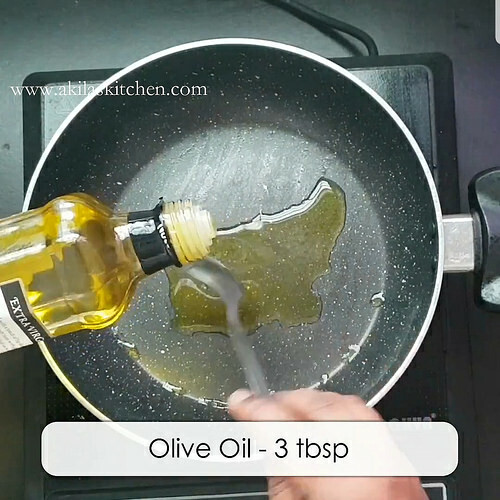 Instead of Olive oil, you can also add butter to the veggies. But Olive oil is good for health and try to use them for pasta dishes. 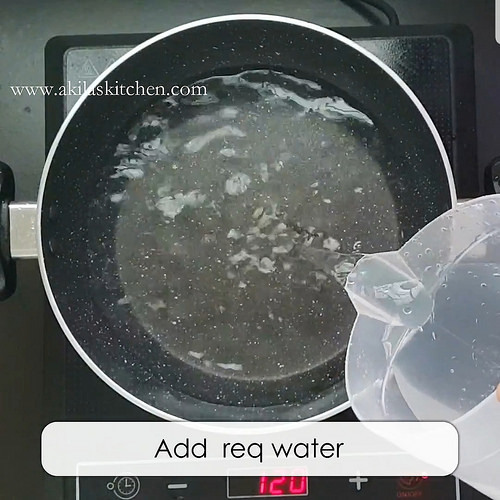 Fantastic Recipe with nice images & fantastic steps.